The annual stoner holiday, 4/20, has finally arrived. Should you happen to be in search of some tasty grub after your celebrations today (or any day really), we&apos;ve tracked down some of the dankest munchies in town. From crazy mac and cheese mashups to ice cream-stuffed donuts, L.A. offers plenty of excellent options for post-weed indulgences. So grab a buddy, pack a bowl (or nibble an edible if you prefer) and get ready to chow down. And don&apos;t forget...uhhh...oh, right, let us know your favorite spots as well. What&apos;s better than getting baked and feasting on some tasty bites? Why, following it all up with classic arcade games and pinball, of course. 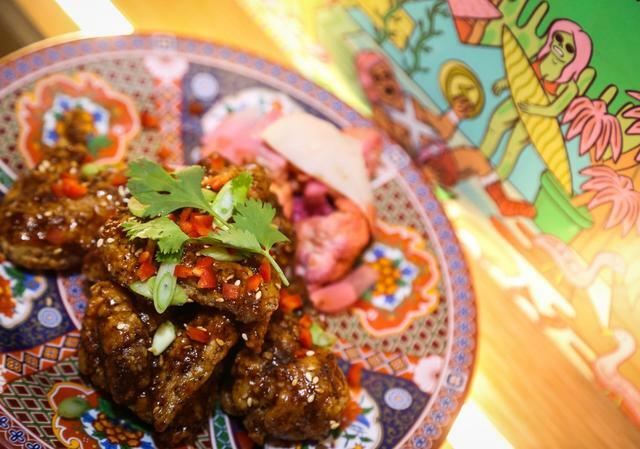 The extensive Starry Kitchen menu at Button Mash is perfect for a post-session feast, but we&apos;re particularly big fans of the double-fried tamarind-chili "waaaangs," the spam fried rice and the dan dan noodles with minced pork. You will also likely need to order the Brick Toast, which features thick milk bread, Nutella, caramelized banana, peanut butter, condensed milk, and ice cream, because why would you not? Now, go lose a few hours playing Contra and Street Fighter. Like a beacon in the purple haze, the signature milky buns at Afters Ice Cream—which recently opened a location in Pasadena—helps guide the red-eyed masses from far and wide. Imagine two large, hole-less glazed donuts smashed together with awesome ice cream inside and you&apos;ll have a vision of a milky bun. Ice cream flavors include the likes of blue cookies and cream, jasmine milk tea, churro, and Vietnamese coffee. 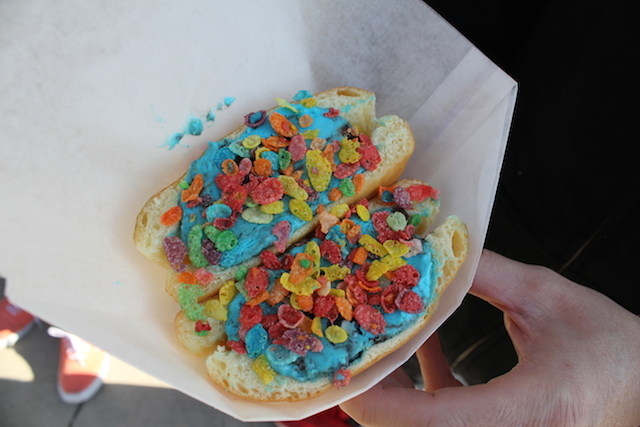 Now, add stoner-friendly toppings like Fruity Pebbles, Cookie Crisp and crushed Oreos to the mix and you&apos;re ready for the full Afters experience. They&apos;re also conveniently open from 12 p.m. to 12 a.m. "errrrrday." Afters Ice Cream has multiple locations. This Texas-inspired breakfast taco outpost offers plenty of flavor-packed bites for all your stoner needs—especially for those who like to wake and bake—but their Frito Pie and loaded queso dip really hit the munchies spot. 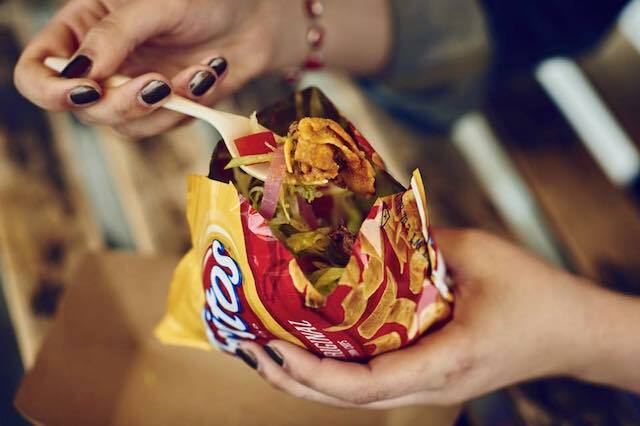 A new spin on an old stoner classic, their Frito Pie comes loaded with chili con carne or black beans, cheddar, lettuce, sour cream, tomatoes, pickled jalapeños, pickled red onion, all piled on top of Fritos...inside a Fritos bag, man. Dig in. You&apos;re also going to want to order up their queso dip, a Tex-Mex classic featuring molten cheddar cheese jalapeños, tomatoes and secret spices, served with crispy, house-made El Milagro chips. Or you can crank things up a notch with the Loaded rendition which adds chili con carne, guacamole, pico de gallo and sour cream. Plan Check&apos;s menu is packed with some dank, umami-tastic options—their signature ketchup leather alone is a weed dream come to life—but their pastrami poutine is really the highest on our list. Just imagine: beef tallow french fries smothered in pastrami bits, pastrami gravy, melted swiss cheese and chopped pickles. Uh, yeah, we&apos;re going to need another order over here. You&apos;re also probably going to want to order up their cruller donuts as well, trust us. Plan Check is located at 1800 Sawtelle Boulevard in Sawtelle, (310) 444-1411, at 351 N. Fairfax Avenue in the Fairfax District, (323) 591-0094, and at 1111 Wilshire Boulevard in downtown L.A., (213) 403-1616. If you&apos;re craving a vegan-friendly 420 feast, Doomie&apos;s is your spot. 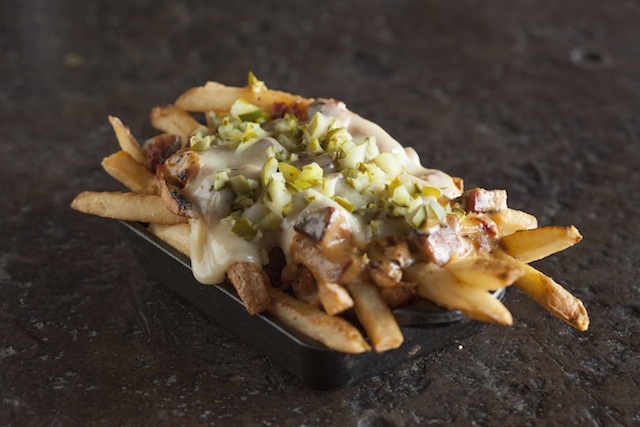 Appropriately-named for the occasion, their Fun Time Fries are the perfect vehicle for their ooey-gooey toppings like veggie chili cheese, buffalo and blue cheese, or animal fries with grilled onions, 1000 island and cheese. The mac bowls are also not to be missed, where you can get their mac and cheese topped with chili, Parm-style with marinara, or Philly-style with cheese, peppers and onions. Of course, there&apos;s always Doomie&apos;s famous &apos;Big Mac,&apos; if you prefer. Doomie&apos;s Home Cookin&apos; is located at 1253 N. Vine St., Ste. 9, Hollywood, (323) 469-4897. 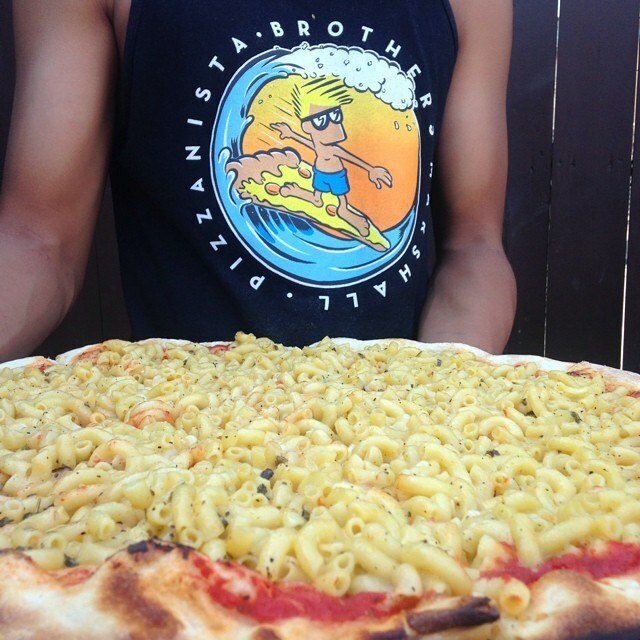 MAC & CHEESE PIZZA @ PIZZANISTA! 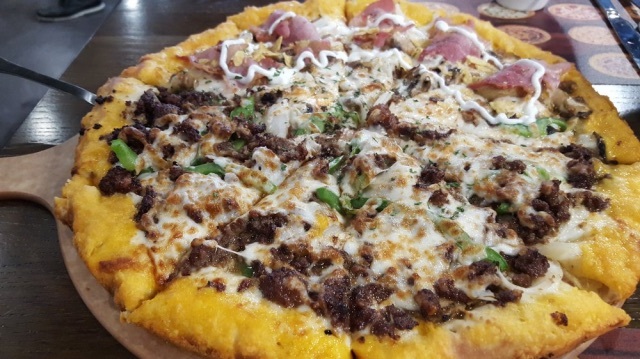 A great many monstrously magical food mash-ups have resulted from severe cases of the munchies—some we&apos;d care not to admit in the light of day—but completely covering a pizza with macaroni and cheese is one of the more inspired. While you can only order this one on Sundays at their Arts District and new Long Beach locations, the wait is totally worth it. They even offer a vegan version for the meat-averse. And in the meantime, you can order up some of their other hits like the fully loaded Meat Jesus or the veggie-friendly Seitan Meats Jesus version for an epic feast. Pizzanista! is located at 2019 E 7th St., Arts District, (213) 627-1430; and 1837 E 7th St, Long Beach, (562) 591-6929. There&apos;s something about cold fried chicken that strikes a special chord when it comes to the munchies. 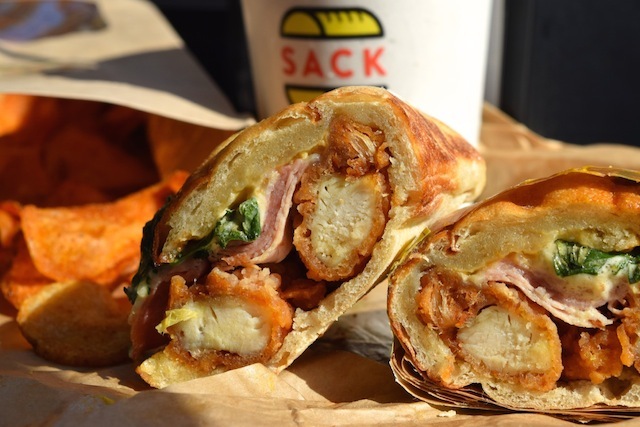 At Top Chef winner Michael Voltaggio&apos;s recently opened shop Sack Sandwiches, you&apos;ll find a particularly 420-worthy rendition. You can grab their super-addictive classic version, which features excellently-made fried chicken with ranch cheese, lettuce, pickles, and hot sauce on their crunchy, freshly-baked ciabatta. Or mix things up with the new Cordon Bleu, which features the now-famous fried chicken along with ham, Swiss, arugula and Dijon mustard. Though you really won&apos;t go wrong with any of the other sandwich options, all of which can be made as a vegetarian version with tofu, or with a lettuce wrap for the carb-averse. We also advise grabbing a bag of the the tasty Old Bay-seasoned potato chips and one of their rich Straus Creamery milkshakes in chocolate or vanilla. Sack Sandwiches is located at 8915 W. Sunset Blvd., West Hollywood, (424) 777-0113; and 8360 Melrose Ave, Los Angeles, (323) 655-7225. At this neighborhood favorite, the aptly-named “So Good I Can’t Remember” bacon wrapped tater tots come stuffed w/ jalapeno, spinach and ranch, and will definitely satisfy a craving. For a bigger appetite, you also should check out the ridiculously towering “Big Ben," which features a stacked mac & cheese croquette with a ½ lb. Niman Ranch burger patty, bacon, 19-house-made country gravy, egg, garlic sambal and chives. Heeeeeeeey, man. Hey 19 Public House is located at 4525 Calle Mayor, Torrance, (310) 378-8119. 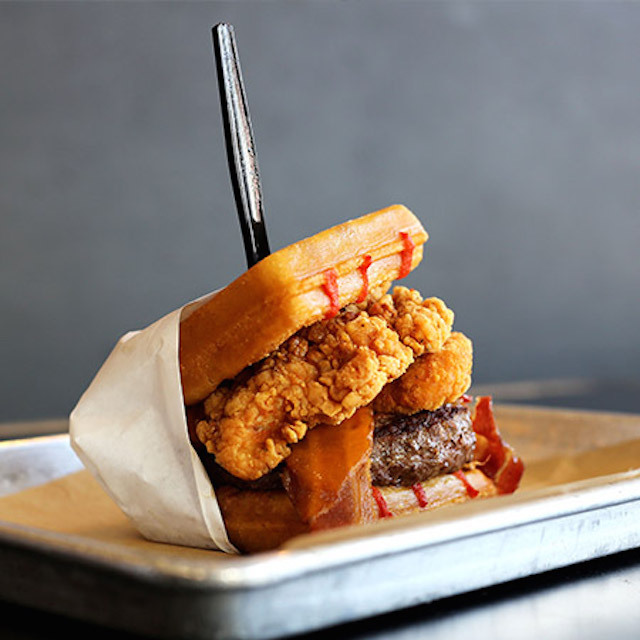 For big, cannabis-inspired appetites, all-you-can-eat Korean BBQ can definitely satisfy, but there&apos;s a special dish at Culver City&apos;s Hanjip that takes the munchies to a higher plane. An elevated rendition of traditional KBBQ corn cheese, this umami-bomb features the added bonus of a roasted marrow bone and a bone luge soju shot when you&apos;re done. 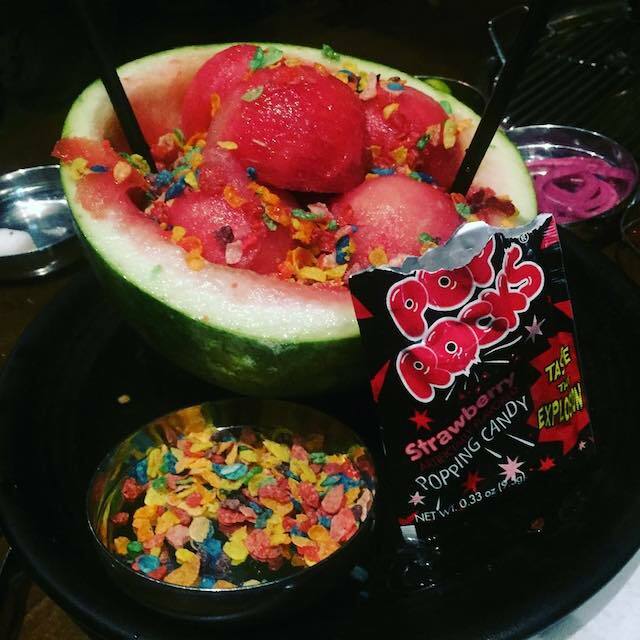 We also highly recommend the equally delicious and entertaining watermelon soju, which is served inside a watermelon shell with fresh watermelon, a generous pour of soju, plus Fruity Pebbles and a packet of Pop Rocks to top it off. Niiiiiiice. Hanjip is located at 3829 Main St. in Culver City, 323-720-8804. Grill &apos;Em All is located at 19 E. Maint St. in Alhambra, 626-284-2874. 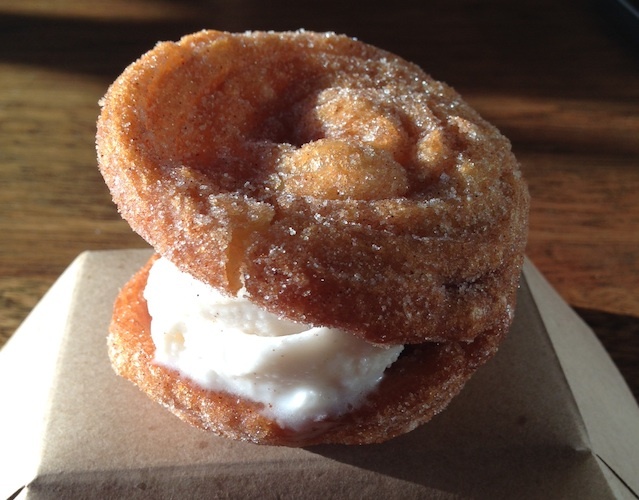 One of our favorite munchies mash-ups is the spectacular churro ice cream sammy at Churro Borough in Los Feliz. They take two of their cinnamon-sugar-coated, freshly-fried churro discs and sandwich a scoop (or two, or three!) of your choice of ice cream flavor—if you can manage such a critical decision at the time—like spicy hot chocolate or the seasonal Cara Cara orange dreamsicle. You can also get churro bits and waffle cone crumbs sprinkled on the sides as well. Or perhaps you&apos;d prefer to order up their more traditional churros with the option of chocolate, toffee or guava dipping sauces, or perhaps refreshing paletas are more your speed. We&apos;re not here to judge. Churro Borough is located at 1726 N. Vermont Ave., Los Feliz. Kogi has three trucks that rove around Southern California Tuesday through Saturday. Check the website for their schedule. 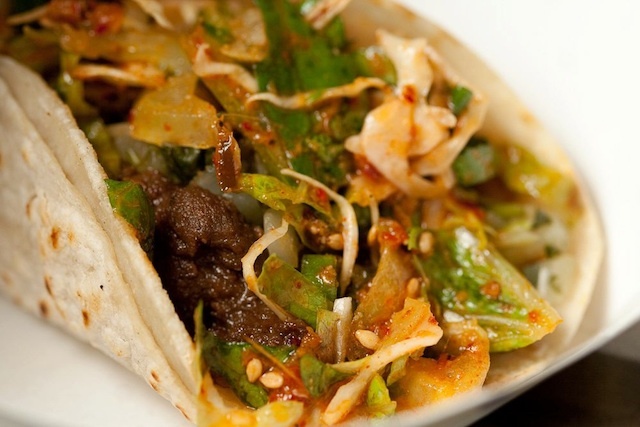 Kogi Taqueria is now open at 3500 Overland Ave., #100 in Palms, (424) 326-3031. 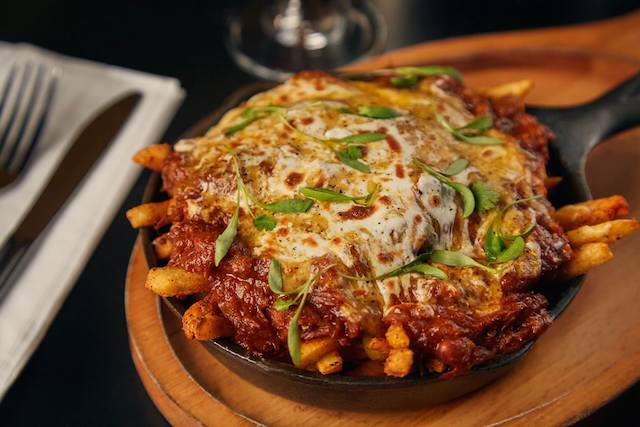 Whether or not your blazin&apos; with the devil, this signature dish at this Westside Tavern is a totally eye-roll-worthy feast if you&apos;re looking for a slightly more upscale stoner experience. A one-pot-wonder—as many of the best are—the Devil&apos;s Chicken features a super juicy chicken breast with potatoes, braised leeks and a mustard breadcrumb crust. You may feel compelled to tuck your napkin in your shirt when you dig into this one. 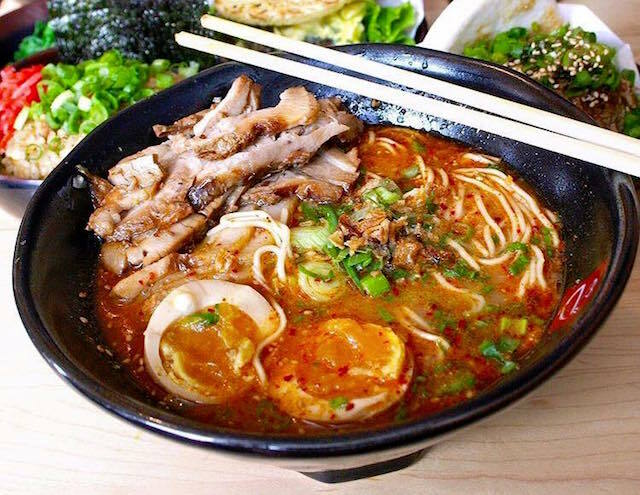 Tatsu Ramen is located at 2123 Sawtelle Blvd. in Sawtelle Japantown, (310) 684-2889, and 7111 Melrose Ave. in Melrose, (323) 747-1388. This favorite beer bar of ours also happens to offer some great options for those looking for something to complement their herbal refreshments. 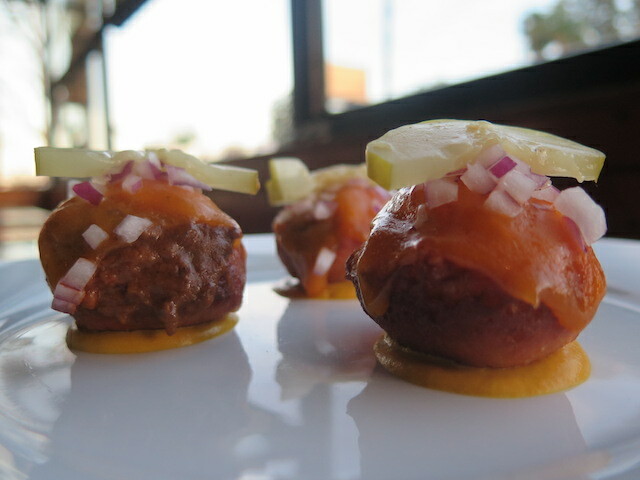 While a feast of their excellent BBQ would serve you well, their Kobe beef chili-filled donuts are a stoner&apos;s savory-sweet-dream come true, and come with cheddar cheese, mustard, onions and pickles. You&apos;re probably going to want to order a few rounds of these bad boys. Boneyard Bistro is located at 13539 Ventura Boulevard, Sherman Oaks, (818) 906-7427. 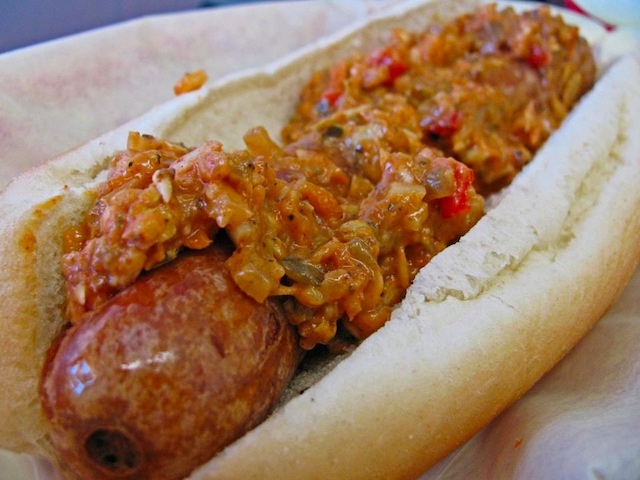 Fab Hot Dogs is located at 19417 Victory Blvd. in Reseda, (818) 344-4336, and 28255 Newhall Ranch Rd. (in the Gateway Village Shopping Center) in Valencia, (661) 607-0333. 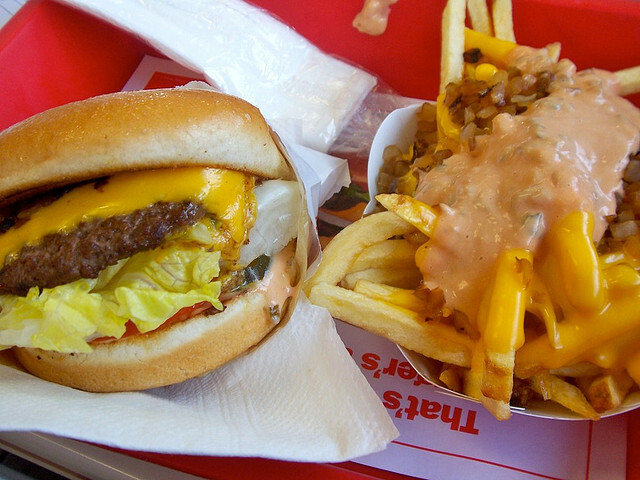 In-N-Out Burger has several locations across Southern California. Check the website for your nearest location if, for whatever reason, you didn&apos;t know where it already is.